JADRANKA KOSOR The HDZ president has reason for concern - the party could go bankrupt if it is established that money from Fimi-media was used to finance itChief State Attorney Mladen Bajic could strike a massive blow against the ruling HDZ party with a single signature, and put the party into bankruptcy. This scenario could turn out to be the epilogue of the Fimi-media financial scandal because, if it is proven that money was funnelled out of state-owned companies for HDZ slush funds, the chief state attorney could seek a temporary freeze on all HDZ assets, and a competent court could rule that the full amount of funds funnelled off be returned by the party to the state budget. And given that a sum of some 40 million kuna has been cited to date in the context of the Fimi-media scandal, a court-ordered distraint could be very damaging to the ruling party - besides not having the funds necessary to pay wages and to cover overhead costs for at least a year, the HDZ would also probably not have a single kuna to cover the costs of the upcoming parliamentary election campaign. As a result Chief State Attorney Mladen Bajic is, probably for the first time in his career, completely independent and practically untouchable - the people and the opposition are satisfied with the arrests and opening of many scandals, the ruling HDZ (Croatian Democratic Union) lacks the clout or opportunity to sack him, and he is in a position to beggar the entire party by an autonomous decision. And while the Fimi-media scandal has been the subject of general interest for a full year now, it appears that no one in the HDZ has given thought to the serious judicial implications of the scandal. Many in the HDZ, namely, thought that the owner of the Fimi-media marketing company, Nevenka Jurak, and her partner, the former head of the Customs Administration Mladen Barisic, would find themselves on the defendant's bench, and perhaps also former Prime Minister Ivo Sanader. Based on known information the State Attorney's Office has charged Nevenka Jurak and Mladen Barisic for the illicit extraction of over 40 million kuna from state-owned firms, and it is believed that a part of these funds wound up in a HDZ slush fund, controlled exclusively by Mladen Barisic and Ivo Sanader, and which was used for the untransparent funding of election campaigns, the purchase of Sanader's limousine and likely some other, for now unknown, expenses. And while it is still unknown how much of the funds that were funnelled off actually wound up in HDZ coffers, and how much wound up in private pockets, it is to be expected that all off these illicitly drawn off funds will have to be reinstated to the national treasury. CHIEF STATE ATTORNEY Mladen Bajic with his deputy Dragan NovoselAs a result it is not impossible that the State Attorney's Office, or USKOK (Bureau for the Prevention of Corruption and Organized Crime), could launch a serious investigation into several years of HDZ financing, i.e. find out just how much money was illegally funnelled off from state-owned companies to the party coffers at HDZ headquarters. USKOK investigators might also gain relevant information about this slush fund from people other than Mladen Barisic, in particular the heads of the state-owned companies from which money was siphoned off to the HDZ. And, if Mladen Barisic does agree to cooperate with investigators, he could, in return for leniency, tell investigators what he knows about some other scandals and crimes, some still completely unknown to the Croatian public at large, and the total mass of money siphoned off and shifted to the HDZ could turn out to be even greater. The HDZ leadership has of late shown nervousness because of the implications related to their former treasurer Mladen Barisic - many feel that only a deal he might strike with the State Attorney's Office, i.e. his confession, could be the key piece of evidence needed to arrest and bring to trial former Croatian Prime Minister Ivo Sanader. On the other hand, as the long-time treasurer in the party Barisic certainly knows many of the secrets and flow of party funds, and his testimony could prove very damaging for the party, and perhaps "drown" some of the members of the HDZ presidency. As Nacional's sources point out, Mladen Barisic and his attorney Ante Madunic are very much aware that they have a great deal of material with which to bargain with the prosecution, which is the chief reason that these negotiations are still ongoing, and might only wind up half way through this week. After Barisic's arrest, both he and the State Attorney's Office took a hard line - he sought leniency for himself and his partner Nevenka Jurak, while the State Attorney's Office, on the other side, felt that Barisic had to provide investigators with much more in exchange for a lighter sentence and more lenient treatment. Besides the concrete details of the Fimi-media scandal - where all of the money wound up and what the probable role of Ivo Sanader was in the entire affair - they also want information on some other cases, some of which have yet to be made public. In any event, Nacional has information from several sources that Barisic will be giving his testimony to USKOK investigators by the end of the week. Whatever Barisic does in fact tell investigators, and it is to be expected that USKOK will treat his testimony as secret; it will at least have the effect of reducing tensions between all those involved in the case. According to the legal expert Nacional has contacted on the topic, the chief state attorney should order a temporary freeze of all of the assets of all suspects in the investigation phase if an illegal extraction of funds is established, and once all the facts have been established and upon the completion of the entire judicial process the court should order the guilty parties to return the entire amount of funds drawn off. In the case of Fimi-media that means that Bajic should already have frozen the assets of Nevenka Jurak and Mladen Barisic, and in some interpretations, if a part of the money siphoned off has in fact wound up in the HDZ coffers, Bajic should also have frozen the assets of the HDZ in the amount of the money siphoned off. 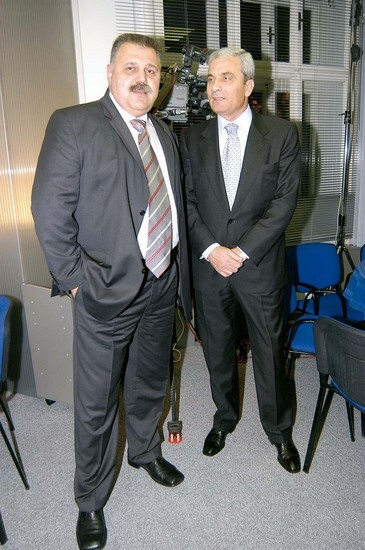 MLADEN BARISIC in the company of Finance Minister Ivan Suker - it was in fact Suker that kept him from being sacked when the Fimi-media scandal first brokeIt is not known for the moment what the defence strategy will be for Nevenka Jurak and Mladen Barisic, nor what they have to date told or admitted to USKOK investigators, but if they confess to criminal acts or strike a deal with the prosecution, it is to be expected that they will behave like any defendant would - they will do their best to diminish their role or guilt, i.e. lay the blame on someone or something else. In other words, for the 40 million kuna in question Nevenka Jurak and Mladen Barisic are likely to claim that they kept only a small part or nothing for themselves, which would mean that most of the money wound up in the HDZ party coffers. Even without their testimony, over all of the past years many have, from opposition parties to non-governmental organisations, often suspected the HDZ of spending much more money on election campaigns that the amounts declared by the party. And while all other parties have spent only money they legally had at their disposal on campaigns, or like the NHS (Croatian People's Party) took out bank loans to cover campaign expenses, the HDZ has never had financial difficulties. Today many in Croatia feel that the chief reason for this was the fact that, besides legal earnings - the so-called parliamentary "head tax" and donations - the HDZ has for years also been financed through a secret black fund run by party treasurer Mladen Barisic. Besides him, the only other person to know about the amounts and the balance of the black fund was allegedly then Prime Minister Ivo Sanader. 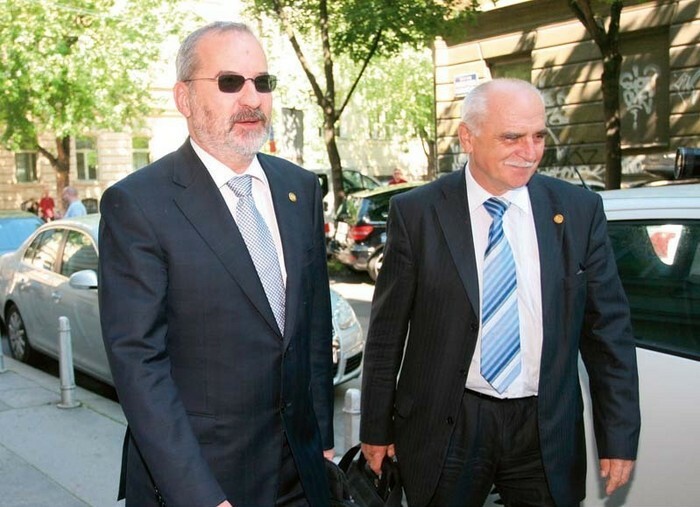 Some feel that, besides these two men, there were several other people in the HDZ who knew of the black fund, and the party's former general secretary, Ivan Jarnjak, has been mentioned in this context. By all accounts the black fund and the illegal collection of money for party needs was concealed from other members of the party, which was probably aided by the conspiratorial authority of former HDZ leader Ivo Sanader, and the poor control mechanisms within the party - although the party's statutes state that the HDZ has a supervisory board, information on who the members of the body are are nowhere to be found, and the same goes for supervision reports, which indicates that there is a possibility that the body does not even exist in the HDZ. But even if what does happen in the end is what many in the HDZ and the public at large would like very much to see happen, and that is that Mladen Barisic directly incriminates Ivo Sanader, that will still not mean that the HDZ is clear of the danger presented by the money that for years poured into the party's slush fund - if it turns out that the HDZ has to return to the state coffers "only" 40 million kuna, or a million or more less, that too would be enough to bankrupt the party. That is the amount that the HDZ "earns" a year - the party gets most of this money from the state budget, i.e. several hundred thousand every year per HDZ Member of Parliament, usually about 25 million kuna. In 2008 and 2009 the HDZ received a little over 23 million kuna from the state, with another ten or so million coming from the budgets of local and regional government budgets. In 2008, the party "earned" another five million kuna from donations, while in 2009 as much as 12 million came from donations. On the other hand, the party spends about ten million kuna on wages and about another five million on other expenses, with the remainder mostly earmarked for promotional services during elections campaigns. When it is all taken into consideration, if the chief state attorney were to decide to order a temporary freeze on HDZ assets, he could only stop the expenditure of money from the party's bank accounts, which would mean that, until the end of the court proceedings, the party would not be able to pay wages, but also - which is worse for any political party - it could not use party funds to finance the coming elections for Parliament. An even worse shock for the party would be a court ruling ordering the return of money that had been siphoned off, because the ruling HDZ could then truly face the possibility of going bankrupt.